It’s a spicy taste of Tex-Mex with this mouthwatering Paleo version of the classic “cowboy food.” Chili is typically made with kidney beans, but usually this is just a way to “stretch” a little bit of meat into a full meal anyway, so skip the antinutrients in the beans, and focus on the delicious part: the juicy, fatty mouthful of pork waiting in every bite. 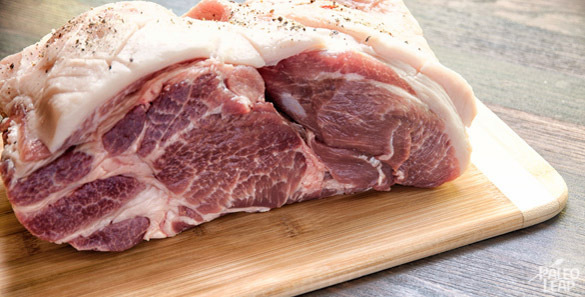 For this recipe, you’ll be using a pork shoulder, which is one of the most economical parts of the pig you can buy, especially if you know how to use the fat and the skin as well as the meat. 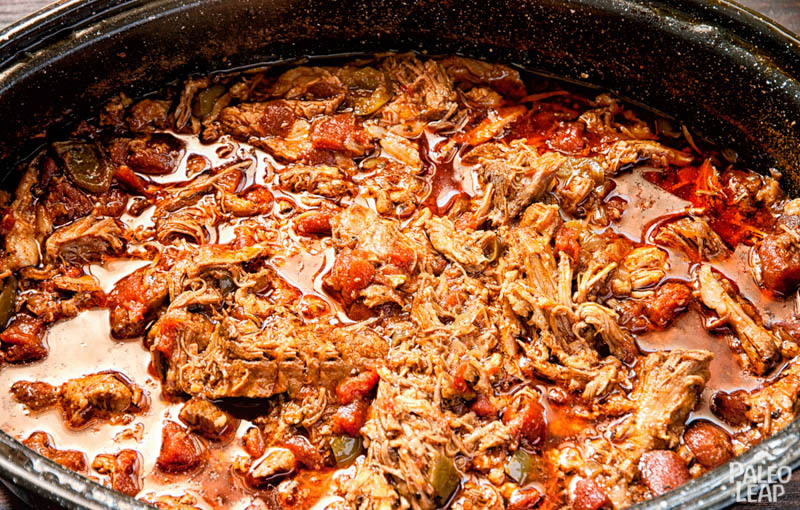 When you cut off the skin to make the chili, you can save the skin for pork rinds, and render the fat down into some delicious lard to use as a cooking fat. I wouldn’t recommend this with a factory-farmed pork shoulder, as pork fat from unhealthy pigs is very high in Omega-6 PUFA and the fat is also where the toxins are stored. But if your shoulder came from a pastured pig, then by all means get the most out of it: it saves you money, and it’s more environmentally sustainable as well. Chili is one of those recipes where everyone has a different taste, so feel free to adjust the spices as you like. I just used two red chilies, but if you like it spicier, don’t be shy about throwing in some more. A small note on the spices, though: this recipe relies very heavily not only on nightshade vegetables (tomatoes and peppers) but also on spices from them (chilies, paprika, cayenne pepper, and black pepper) so it probably isn’t the best choice for people struggling with autoimmune disorders or nightshade sensitivity issues. But everyone else should be able to eat it without problems, and enjoy another family favorite made Paleo. SERVES: 4 PREP: 25 min. COOK: 3 hrs. Warm the olive oil in an ovenproof stew pot over a medium heat; then add the garlic, onions, and red chilies, and cook for 3 to 5 minutes or until the onions are soft. Lower the heat and add the bell peppers, diced tomatoes, chili powder, smoked paprika, cumin, cayenne pepper, oregano leaves, and salt and pepper to taste. Place the pork shoulder in the pot, give everything a little shake, then add the red wine vinegar, and pour in enough water to just cover the meat. Bring to a boil, cover, and place in the oven for 3 hours. The chili is done when you can easily break the meat apart with a fork.